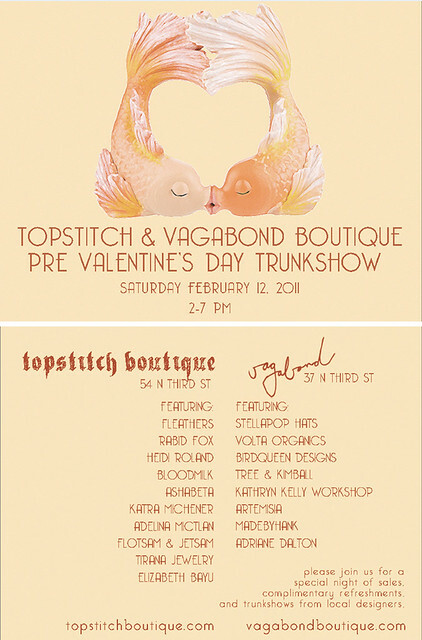 madebyhank will be part of a pre-valentine's day trunk show taking place at both vagabond and topstitch T O M O R R O W (saturday, february 12th). madebyhank will be at vagabond, from 2-7 pm. both shops are located in old city philadelphia, on third street between market and arch. and hopefully i will have the chance to photograph a few new items to add to the shop for monday. enjoy your weekend! xo, hank. Will it be the bags or the sewn drawings? Looks fun! it will just be bags!